It’s hard to believe that it has been a year since the big birthday blowout but the calendar doesn’t lie. Since this was not a round number birthday the event was a good bit more modest but of course I cooked and shared the event with good friends. 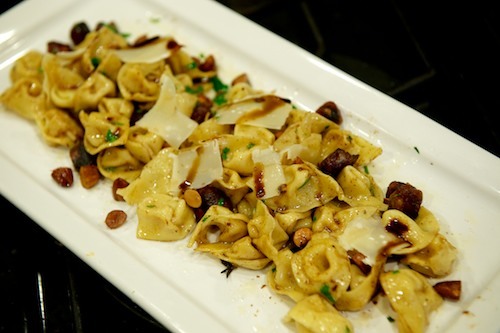 After some cheeses on my baguettes we had a first course of Delicata stuffed pasta in a brown butter sauce with dates and almonds. This is from the SPQR cookbook (local restaurant in San Francisco). I would have never put these ingredients together but wow what an amazing combo. 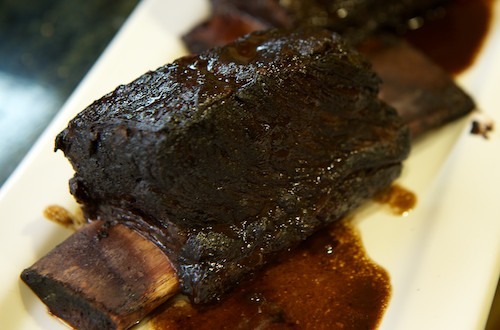 Next up another SPQR recipe this time braised short ribs which were braised for 22 hours in the sous vide before being finished in the oven. Served these with roasted rapini and polenta. 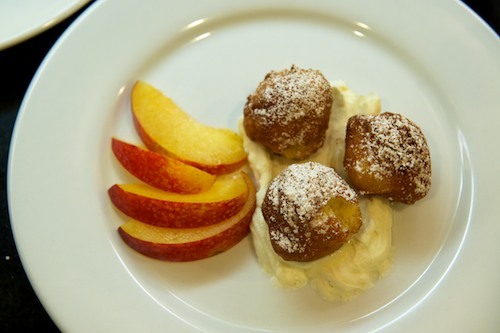 For dessert I created a ricotta donut and served it fresh market plums and a marscarpone cream. Not bad for something I made up but somehow not perfect. Probably should have piped them out long. Make standard Pâte á choux with first five ingredients. When cooled a bit add the remaining ingredients and stir well. Pipe into small rounds and freeze until ready. Fry for several minutes, until golden brown in 350 degree oil. 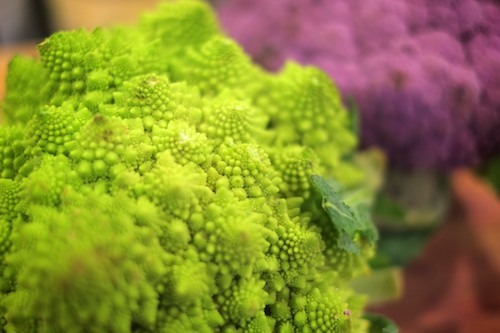 Spectacular heads of cauliflower are in season here in California. 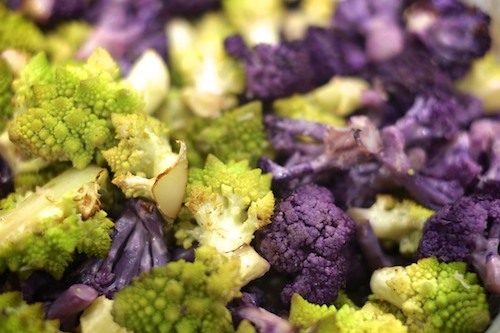 I couldn’t pass up this beautiful purple and my favorite, romanesco, which my son calls Alien Cauliflower. 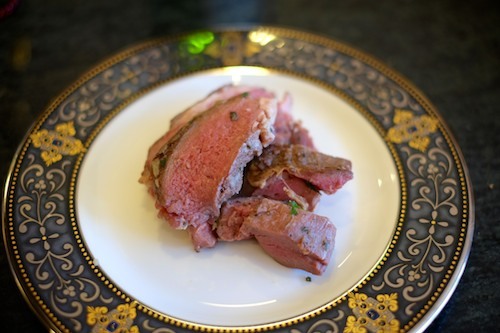 One of my favorite ways to prepare it is also one of the simplest: roasting. Preheat the oven to 425. Wash the cauliflower, core, and separate into bite sized pieces. Toss with olive oil, salt and pepper and roast in a pan. 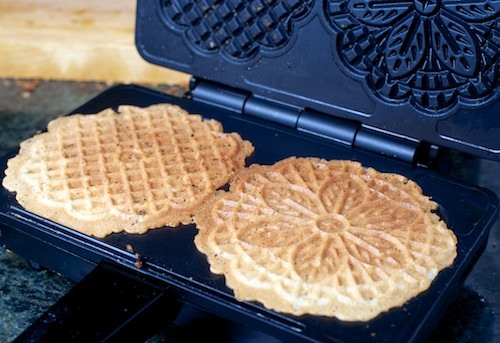 It is best to place them in a pan large enough to hold them in a single layer. Roast 20-30 minutes tossing occasionally until as tender as you desire. Toss with a little butter and check seasoning. I didn’t really measure much of the above so use as guidelines. 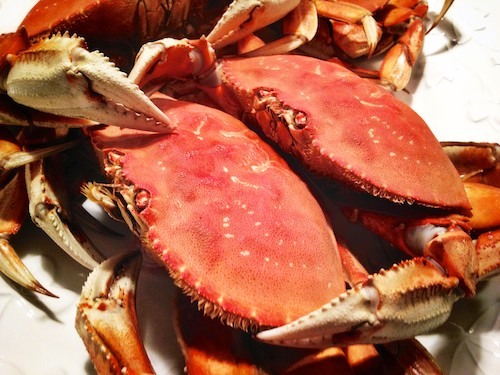 Bring to boil and toss in the crabs. Boil for four minutes and then move pot of heat and steep for 30 minutes. Remove to platter. You can chill if you’d like but we just ate them when they were cool enough to touch. It was some of the sweetest, most delightful crab I have ever had and fortunately the children didn’t really eat their halves :). We had some first time visitors for dinner Saturday. I never quite know how people are going to react to their first dinner. I never know how many times my wife will have to apologize for her crazy husband’s cooking. I’m happy to report we did well on both fronts. 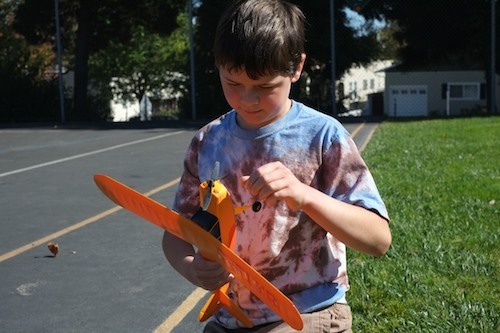 The dinner was complicated by us being out Friday night, me participating in a running event Saturday morning, and my son acquiring a remote controlled airplane which, of course, required spending some time in a field trying to get it in the air. As a result the dinner required dipping into the strategic reserves. One of the guests is French so my mind landed on featuring lamb and flageolets in the main course. I love lamb and thought about doing racks but they are just horribly expensive. If you move down a touch you can find the chop. I’ve started buying the whole cut that turns into chops and then taking both pieces of meat off the bone and tying them together to form a roast. I did this Thursday night seasoning with rosemary, salt, pepper, and anchovies (yes try it!) then left them to cure. Before the guests arrived these got dropped into the Sous Vide machine to cook to rare over two hours before browning on the stove. One of the guests claimed it was the best lamb they had ever had. Who am I to argue ;)? The rest of the menu fell in to place after consulting a few more cookbooks and the larder. A nice make ahead is the Comte crackers from Dorie Greenspan’s excellent Around My French Table.They can be made ahead and then sliced and baked as your guests arrive. With the crackers I served some bread with roasted Piquillo peppers and sheep milk cheese. I had roasted and frozen these a few weeks before not knowing when I would use them. 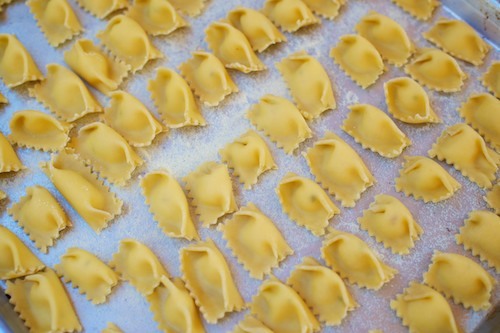 The first course was the tortellini that I had learned to make at Flour + Water in a consommé, both of which were also in the freezer. With the lamb and beans (which were also cooked and frozen) I served a Heston Blumenthal inspired salad of radicchio, greens, shaved blue cheese, hazelnuts, and pears. And since my wife won’t eat lamb I did butter basted chicken for her. On the list of things to try was a cake from Miette, a local bakery that produces some killer cakes. I had just read an article that put their Tomboy cake on a short list of best cakes in the country so how could I resist even though I have limited experience with layer cakess. Not as pretty as their versions but quite tasty. 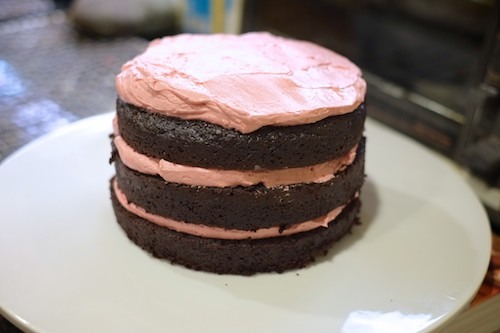 It is a rich, double chocolate cake with a raspberry buttercream. 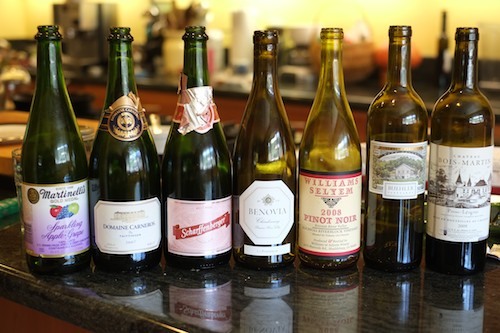 I am pleased to announce that we were also able to consume five bottles from the wine fridge over the course of the long evening! I chose a nice creamy Benovia La Pommeraie Chardonnay to pair with the tortellini. The Selyem Rochioli and Beuhler Cabernet accompanied the main course. The sparkling cider is what we call “kid’s wine” and the sparkling fermented juice was served at the beginning of the evening. The pairings were quite successful. It was a fantastic evening. There is nothing quite as satisfying as cooking in front of an appreciative audience and our friends were that and more. The meal has left a lingering glow in the house even after the last of the wine glasses was cleaned and put away. Chop the rosemary and anchovies and then rub together with the salt and lemon zest. Add olive oil until you have a spreadable “paste” and rub all over the lamb roasts (I trimmed some of the extra fat as well) and marinate for 24-48 hours. Tie the roasts and vacuum seal. Warm the sous vide to your desired doneness in my case 130 F (54.5 C) for the bottom end of medium rare and cook for around two hours. Pull and dry the roasts while you heat a pan. I added some garlic, thyme, and butter to some olive oil and seared the roasts while basting them. Slice and enjoy! It was back to school week so it seemed appropriate to head back to Flour + Water for more pasta class, this time with a friend. I had jumped in at the intermediate class and quickly decided I had to come back for the advanced class. 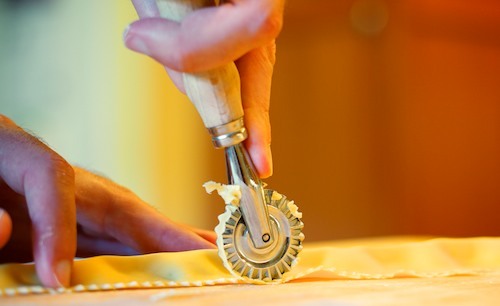 I heartily recommend these classes to anybody in the Bay Area interested in learning how to make pasta. The staff is great, you meet some interesting people, and you get to eat! 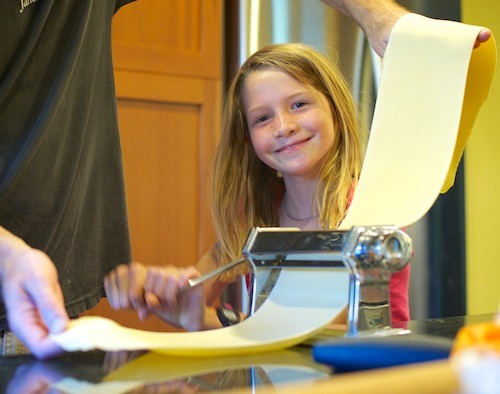 You also learn and practice how to make pasta under the supportive and expert hands of the Flour + Water cook staff (this time Matt and Ryan aided by Stephanie thank you guys!). 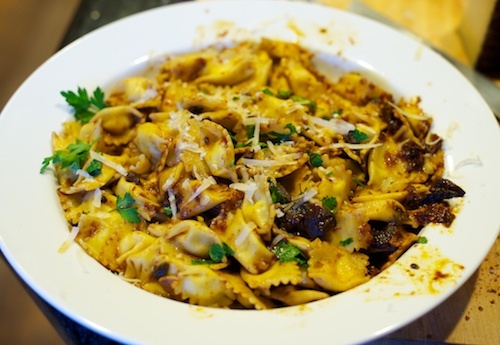 We made two pastas: Cappellacci Dei Briganti and Tortellini. 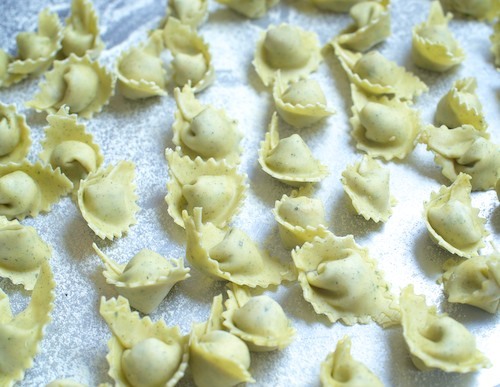 The Tortellini was a Nasturtium dough with more nasturtium leaves in the filling. It smelled fantastic. 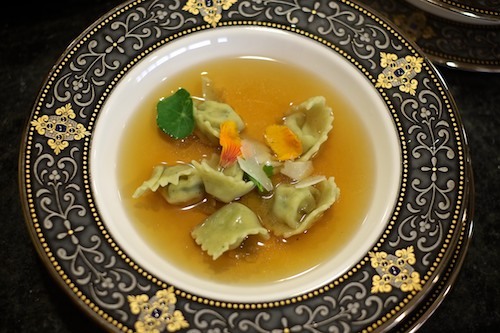 When dinner rolled around they served it in tomato water “brodo.” What an inspired idea! I was psyched to get home and try myself. You can imagine how crushed I was to venture into the garden and find the thriving Nasturtium plant we had was gone. Never one to give up, I decided to use some herbs instead. 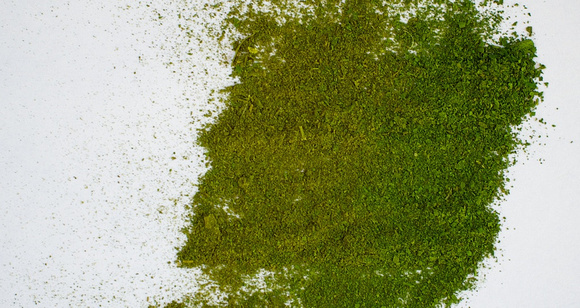 I pulled out the dehydrator and dried fresh parsley and tarragon which I then ground into a fairly fine powder. I put close to 2 grams each into around 350 grams of 00 flour. For the filling I roasted some chickens as I worked on my tomato sauce. 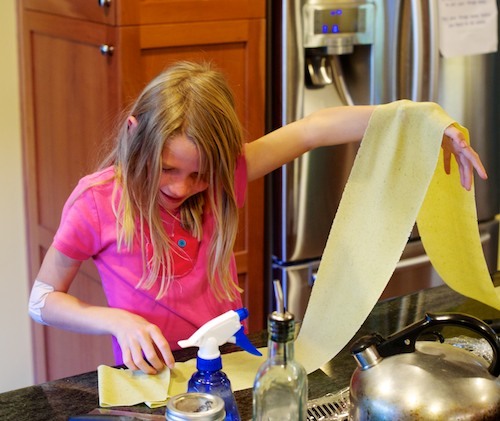 The next day I made the filling and with some help from my daughter rolled out and made a crowded half sheet pans worth of tortellini. Sweat the shallots in the olive oil for a few minutes and then add the garlic. Rinse and tear the chard from the ribs and roughly chop, drain and add it with the fennel and chili. Throw everything except the eggs and herbs into a food processor and grind. Season to taste with salt and pepper adding the herbs. I let it sit in the fridge for a while to come together and then added the eggs. 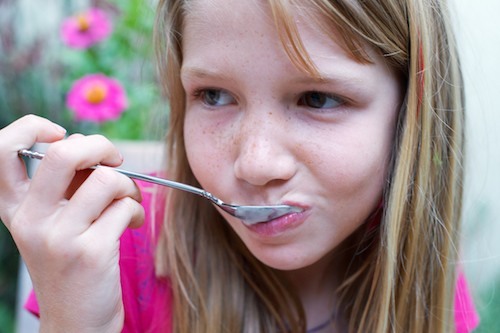 A few years ago Buy Rite ice cream opened up in San Francisco. The flavor that got the most excitement was salted caramel. As soon as I tried it I knew I had to figure out how to make it at home. The trouble was the salt in the recipe lowered the freezing temperature. My ice cream maker (the kind you put in the freezer) churned its heart out but could only deliver slush. So, of course, I “needed” a freezer with its own compressor. The problem was I was never satisfied with the results! And so every now and again I would pull the machine out and try again but it was always the same: icy texture. Recently both Buy Rite and Humphrey Slocombe (another local ice cream place) came out with cookbooks. It was time to try again. This time I had a thought. 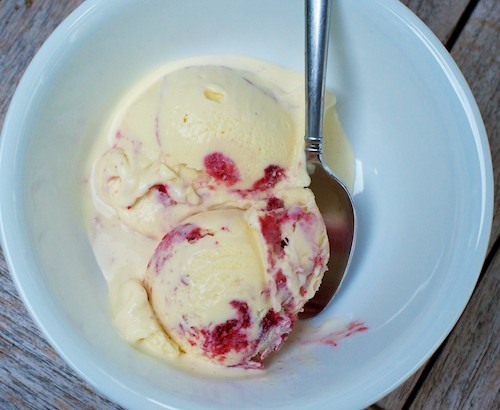 What if I let the ice cream maker get fully cold before I started? When it was good and frosted up I poured the base in (which had spent 10-20 minutes in the freezer) and viola perfect texture! Why the instructions don’t tell you to do this I don’t know but please, let your machine get good and cold before you pour! Of course I needed to make a lot of ice cream to practice. 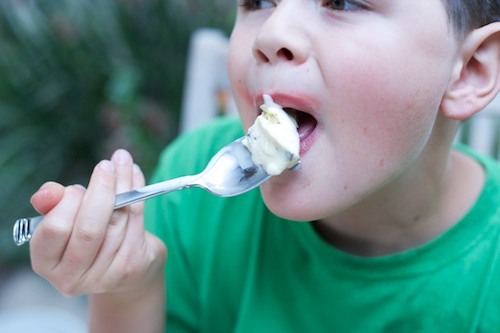 I thought it would be fun to have the kids each pick a flavor and then help me make it. Connor chose Mint Chocolate Chip and Annabelle chose White Chocolate Raspberry. It is interesting to note that I would not have personally chosen either of these but they were both fantastic! And what do you do with all those egg white? 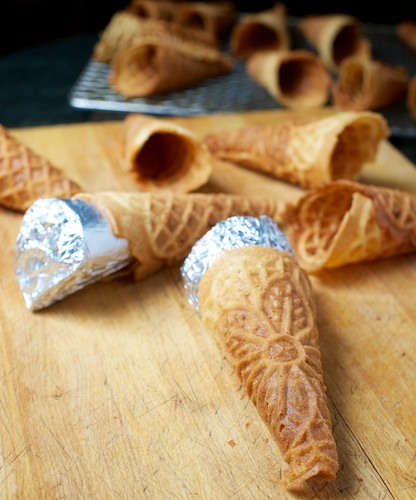 How about homemade ice cream cones made in a Pizzelle machine! You can find the recipe for the salted caramel ice cream here at Serious Eats although I will say that unlike the poster I always use the dry caramel method. I would also recommend the Buy Rite ice cream cookbook. I have yet to be disappointed! I love cookbooks. My bookshelves sag with the evidence. Alas cookbooks can only go so far. They cannot convey feel. They cannot convey smell. They have no way to teach intuition. Sometimes, despite your best efforts, you can try to follow a recipe and just be wrong. 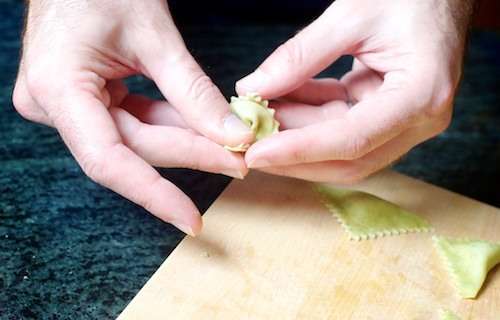 I have made pasta many times from many different cookbooks and based on these attempts I have developed a technique. It turns out my technique was wrong. 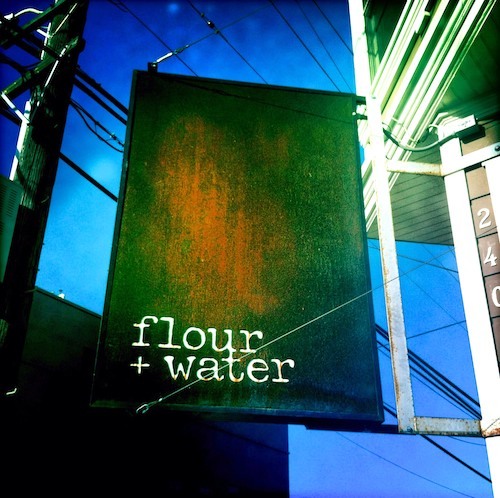 Flour + Water offers pasta courses. I found out about an upcoming series on sf.eater.com. Much to my dismay the beginner class had sold out before I got to the website. With some encouragement from my wife I decided to start with the intermediate course. 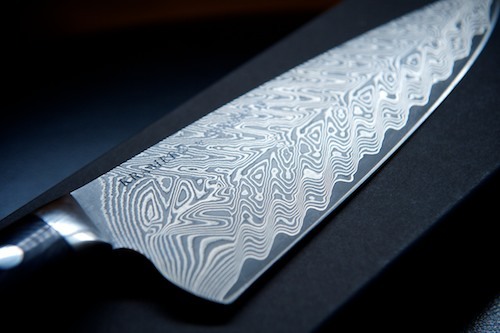 The chance to go to a restaurant of this quality and learn technique was just too good an opportunity to pass up. 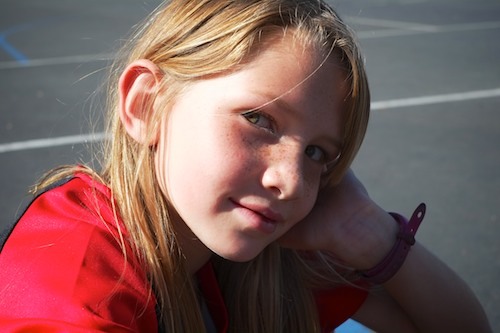 My daughter is the best cranker in the world! I really didn’t know what I was getting into but the class ended with dinner so I figured I had nothing to lose. In short the course is fantastic. They have constructed it to allow people of all levels to get what they want out of the class, have a great time, and meet interesting people and none other than Chef McNaughton teaches the class which pretty much floored me. Oh yeah, did I mention they serve dinner and keep your wine glass full?! Suffice it to say I will be returning for the other courses. 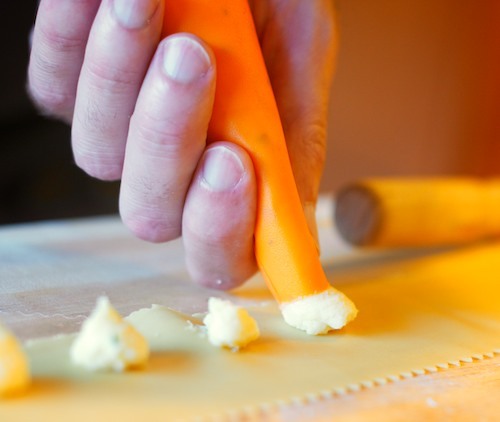 “Make a well… lightly flour board… elastic… little sticky… smooth as baby skin” If you’ve ever made pasta from a cookbook these are familiar refrains. They are trying but until you’ve seen what it is supposed to look like and until you’ve felt what it is supposed to feel like it is hard to know what you are looking for. The single most important thing I learned in the class was to use as little moisture as possible to form a ball. Chef McNaughton recommends adding water with a spray bottle very slowly until you reach this point. When done right, no flour is needed for the board and no flour is needed later on in the process either and yes, after you are done it feels like baby skin ;). 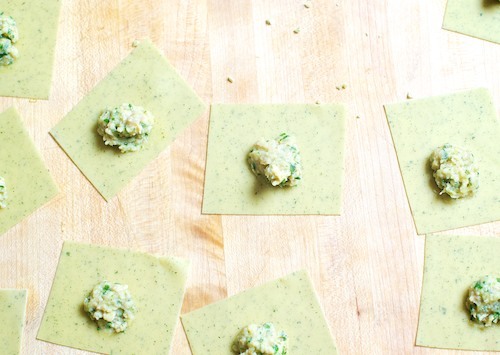 I simply could not wait to try it at home so Saturday my daughter and I rolled up our sleeves and made ricotta agnolotti. Actually I kind of made a beurre blanc with some shallots and added ricotta, parmesan, fontina, parsley and egg and seasoned until it tasted great. 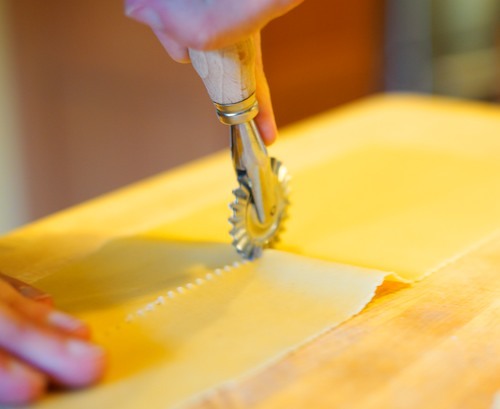 I won’t lie, making two half sheet pans of agnolotti took some time, actually quite a bit of time, but I could tell while I was working that it was turning out better than ever before. I made them a day ahead so I froze them and stored them in some bags until boiling them for a few minutes in well salted water. I made a quick sauce with more shallots, dried porcini, my homemade tomato sauce, and some red wine. The results were amazing. Finally, I had made pasta!! P.S. All of the action photos were taken by my daughter! Thank You!